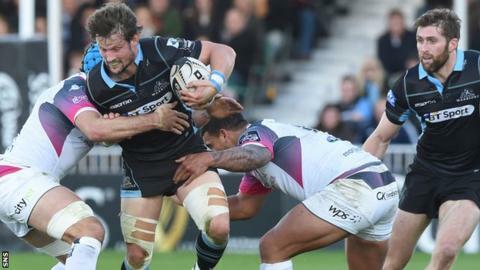 Glasgow Warriors head coach Gregor Townsend praised his returning international players after a bonus-point victory over the Ospreys. Scotland's Peter Horne, Tommy Seymour and Gordon Reid were restored to the starting XV after Rugby World Cup duty. "Some of (the international players) have been really affected by the World Cup," he said. "Mentally, physically, it's a huge tournament to be involved in, so it's a credit to them that we were so fluent." In keeping with rest protocols, Townsend has gradually drip-fed his Test contingent back into his matchday squads, both in last week's loss at Leinster, and Sunday's impressive home win. Notwithstanding those nursing injuries, or facing surgery, all will be available for selection for the trip to Cardiff Blues in seven days' time. "We had a training session on Wednesday and Tommy Seymour and Peter Horne - the performance they put in showed how much they care about the club," added Townsend. "When you've been away from something you love, you come back wanting to be involved and that's what they've shown." Townsend was not unduly concerned by a one-point half-time deficit, despite Glasgow's clear supremacy in terms of territory and possession. "We knew Ospreys had targeted this game - they talked about it being a must-win during the week, they'd lost four out of five," said Townsend. "They brought back Dan Biggar and Alun Wyn Jones; we knew it was a real challenge. "Even though we were trailing a couple of times during that first half, we imposed our game in attack and defence. "A couple of offside penalties hurt us and gave them six points, but if we continued to play like that and upped the accuracy, I felt we would get tries, and the players delivered." Referee Peter Fitzgibbon inflamed the home crowd with several penalty decisions, but as Glasgow turned the screw after the break, he sent visitors Josh Matavesi and Ryan Bevington to the sin-bin. "We'll watch the game another three times before we work out whether the decisions were all right or not," continued Townsend. "Definitely the two penalties for offside, we were wrong. The way we were playing, we were getting more penalties, and when you build up more infringements you run the risk of a yellow card and that happened against them. "It was a much-improved performance in terms of our discipline from the last few weeks, but it has to improve again." Meanwhile, Glasgow centre Mark Bennett missed out on being named World Rugby Breakthrough Player of the Year. The 22-year-old was among three nominees, but the award went to New Zealand wing Nehe Milner-Skudder.